Shooting tips: Is line more important than lead? One sees many articles on shooting technique and it is the subject of hundreds of books, most of which I have read. Yet it amazes me that while stance and forward allowance are much discussed, the vitally important subject of reading the line rarely comes up. It is a strange omission. When you watch people shoot it soon becomes clear that most misses are behind. There are various reasons for this. A lack of appreciation for the range of leads required and stopping the gun are both common problems. The latter is often induced by a style in which the arms rather than the body are used to power the swing. The most frequently seen error is to slash to a sudden stop, rather than let core body rotation or deliberate body arching/bowing be the engine of a smooth, well powered but well controlled swing and follow through. A significant number of birds are missed in front too, especially partridge, which flap a lot but don’t actually fly very vast, and lower flying pheasants. But, many birds are missed off line on the typical driven day too, and not just high ones. And this subject needs to be mastered if you wish to become a first class shot. Simple line errors on driven birds may just be caused by eye dominance issues and/or gun fit. I have lost count of the number of times I have seen a right-handed person, who keeps both eyes open, repeatedly shooting to the left-hand side of straight driven birds, and being completely unaware of it. When you point it out to them, they are often stunned. They just do not realise they are doing it. Another common error is to fail to notice a bird is going slightly right or left of line and to misread it as straight. This is usually down to excitement and lack of experience, but we can all make the mistake. One must always watch one’s quarry and its movement carefully. Don’t rush at it. Look. Visualise a grid in the sky, or a central imaginary line to your position, and try to pick up the subtle differences of angle. Shooting tips: What’s the solution? So, how do you solve the problem? Well, first you must be aware of it, and a good place to start is the pattern plate. If you have an eye-dominance or fit issue it will become immediately apparent at a pattern plate. Provided you don’t cheat and make a correction, you will see your shot pattern consistently going to one side. Just focus on the mark and see what happens. If you don’t have access to a purpose-built pattern plate at a shooting school, you can easily make a simple wooden frame and cover it in paper. Or use two six-foot beanpoles with a suitably sized piece of paper or card taped between them. You must also obviously make sure there is a good backstop or open field behind. When you shoot at a plate, if you notice an error to one side, try squinting the eye opposite the rib when you pull the trigger and you may see the pattern immediately centred. You can also put a spot on a pair of shooting glasses that obstructs the pupil of the eye opposite the rib. If neither of these work, your gun may require a bit of cast to compensate for your eye dominance. You should then be able to shoot with both eyes open, but if you can’t then I’m afraid you just can’t. Eye dominance often becomes more of an issue in middle age, and the decision to squint an eye or not will have to be made by practical experiment. However, keeping both eyes open has particular advantages for driven shooting, even though not everyone is well advised to do so. It depends on you and the extent of the error (or, as I call it, ‘pull’) from the eye opposite the rib. Some will shoot a yard to one side of the average bird without squinting/occluding an eye or possessing a very bent gun. Always watch the bird’s movement carefully. If you look closely you will soon get used to picking up the flight line quite easily, and then you are halfway to winning the battle. There are issues with squinting that must be considered. It may be difficult to shoot a straight driven bird while squinting because you lose sight of it as you pull the trigger, hence extra cast is often, but not always, the best solution. 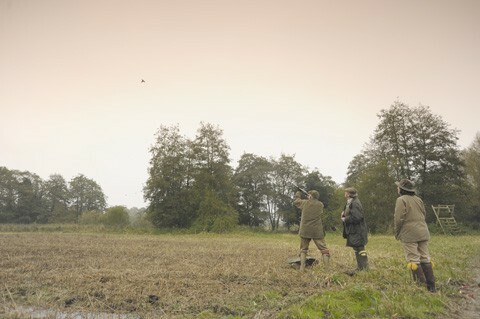 Some shots adapt well to shooting mid-range birds ‘blind’. In this case timing becomes all import. Muzzles to the tail feathers, onto the body and squint, push, bang! Forget that slightly unnatural but necessary push and you will almost certainly stop and miss behind if you are shooting with one eye. I have found people respond quite well to training in this area. But there is usually a ceiling at which the ‘blind’ shooting technique breaks down (usually about 30 yards), though some people, interestingly, manage at higher ranges. An unusual but potentially effective technique to avoid shooting ‘blind’ is to start squinting an eye to find the line, then open it as you come to the bird and benefit from full binocular vision at the key moment, thus allowing yourself to see a forward allowance gap. You can also, of course, turn and take the shot side on and this is especially useful for high birds. As always, you need to experiment. Misses off line on crossing and lower quartering birds may be caused by poor stance, with the weight/centre of gravity too far back, which often causes the head to lift. This effectively raises your back-sight, and a miss high and behind often follows. Try it for yourself with a proven empty gun in a safe place. As you dry swing, let the weight come back onto the rear foot and not ‘nose over toes’ as should normally be the case throughout the swing. Lift your head and slightly break the positive (but not excessive) contact you should normally have with the stock. You will see the gun tends to rise off line and stop. The remedy is to keep the weight properly forward and the head in positive contact with the stock throughout the shot and follow through. One sometimes hears how canting the barrels (when the mounted gun does not sit vertically in the shoulder so that the barrel stack leans to either left or right) may be a bad thing, but many misunderstand the nature of the problem. Disrupted visual contact and stopping apart, failing to follow the line of the bird smoothly is one of the most common errors game shooters make. It causes visual confusion and poor movement. There is no problem with canting, as long as you do so to keep the barrels in line with the bird. At the moment the shot is taken at a bird going to one side or another, the barrels of a side-by-side should, ideally, be parallel to the flight-line, and those of an over-under perpendicular to it. So, to re-emphasise, there is no problem with canting the barrels, as long as you understand why you are doing it and it is a measured reaction to the flight line. There is a particular danger on driven shots quartering slightly to one side. Guns who are lazy or lacking clear perception may attempt to take them as if they are straight. If you shortcut the process of finding the line – as you may do if you come up in front of the bird rather than finding it by one version of swing through or another – it does not usually bring good results. The barrels of your over-under should always be perpendicular to the flight line of the bird. The issue is the angle of the barrels relative to the line of flight. As we’ve heard, sometimes you will hear it said you should not cant your barrels. But what you must not do is cant your barrels to such an extent they are out of sync with the line of flight. There will usually be a tight arc to the front where you can take birds as straight driven without even having to think about canting the gun. Outside this arc (10 degrees maximum), you will need to actively adopt another technique to shoot well. Before considering it, let me just note what sometimes happens. A bird comes to you at mid-to-lower height and slightly right (outside the 10 degree arc), and you take it mistakenly as if it were a simple driven shot. The barrels don’t match the line of the bird and you lose that important connection. Your back over-arches, your weight comes back on the rear foot, you lose balance and your head lifts. You miss off line, high and behind, and feel a bit perplexed! That’s how not to do it, so let’s now consider how to take this particular bird well. First, anticipate where you want to kill it and move your feet if possible. Moving your feet is always important because not doing so will tend to create tension and cause you to miss underneath. Now for the crux of the matter: actively, but slightly, twist the barrels relative to the line of the bird so that they match the line. For a right-hander this controlled canting (accomplished by both hands working together) is slightly clockwise if the bird goes to the left, and anti-clockwise if it goes to the right. Thus a quartering bird ends up being treated more like a crosser. If you are using a side-by-side shotgun, imagine a line drawn horizontally through the muzzles. It must remain parallel with the line of the bird as you swing. In the case of an over-under, a vertical line drawn through the muzzles must remain perpendicular to the line of the bird throughout the swing. So you must cant the barrels – but you must not cant them too much. You need to maintain the correct relationship between the barrels and the flight-line of the bird. Keep your face well into the stock. If you don’t you will miss off line. Your front arm must work hard to hold the line and you need to make subtle corrections to mimic the line. You should not start with the muzzles miles away from the bird, and you must learn to lift the barrels well. Poor attention to footwork, which creates tension in the swing and a weak or inactive front arm, will often lead to misses below the line of the target.